FamilySearch’s New Web Tool Makes Ancestry Records Easier to Find! Précédent : Article précédent : L’enregistrement pour RootsTech 2018 est ouvert ! Suivant : Article Suivant: Le programme des ateliers de RootsTech 2018 est connu! « FamilySearch International, a leader in historical records preservation, has launched its new web-based indexing tool. Indexing is a technology used to make the world’s historical records freely searchable online for family history research. The new program makes it easier for online volunteers to participate using web-enabled computers, laptops, or tablets, and enables FamilySearch to expedite its online publishing of completed indexes. Global nonprofit FamilySearch digitally preserves billions of historical records online to help individuals with their family history research. It has published billions of images of historic records from all over the world online. 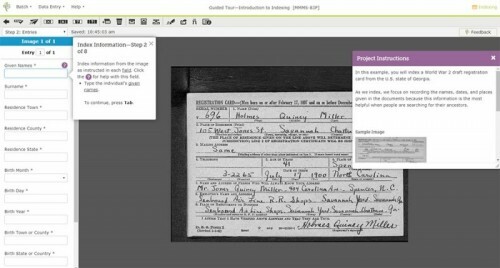 Researchers can find the record images in FamilySearch’s Catalog or Historic Records Collections online. But searching through billions of images online in search of one’s elusive ancestors is not fun for the average person. They want to type in an ancestor’s name and known context, press Enter, and voilà, see highly matched results from their search query. Ericson says the new web-based indexing platform will enable more volunteers to participate worldwide and increase the rate at which FamilySearch can make indexed records accessible online. « It is a straight-forward experience that no longer requires people to download software, » said Ericson.